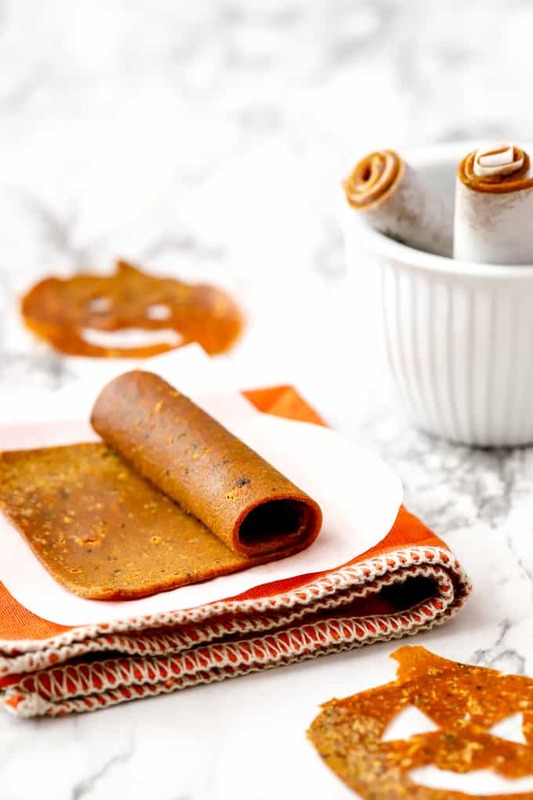 In the spirit of all things trick or treat this Halloween, this Pumpkin Fruit Leather is the perfect balance between the two for your family. 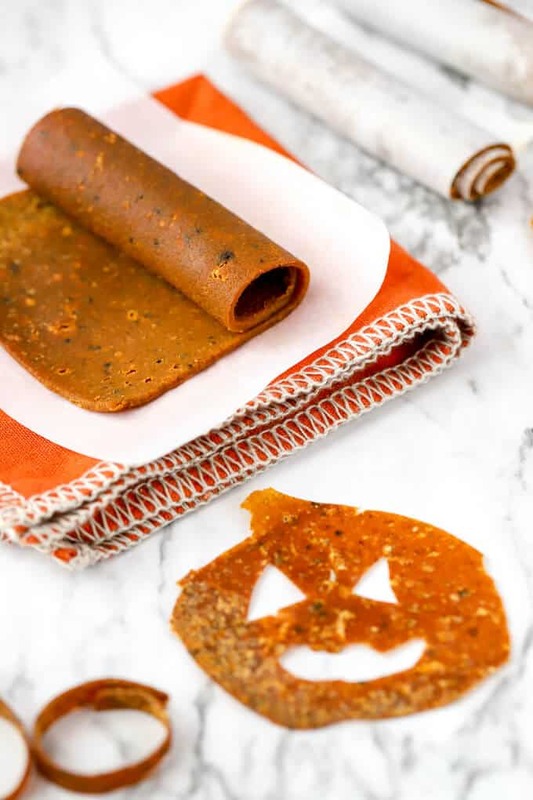 The trick is that pumpkin fruit leather is a healthier option than many of the sugar-laden snacks that we see this time of year. The treat is that this gluten free, homemade snack is tasty and your kids will love it! Have you made fruit leather before at home? A simple and short ingredient list along with basic preparation steps create this kid-friendly snack. A key ingredient not listed on the recipe? Patience. The baking time– really just the time that the pumpkin fruit leather dries out in the oven– is four to six hours. Yup, a long time. So plan ahead and the rest is easy. 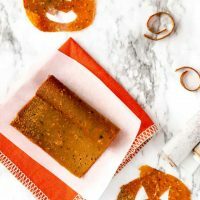 Making pumpkin fruit leather at home gives you an advantage over the store-bought boxes of fruit leather that we grew up eating. Can you picture those rolls in your lunch box? Well here is an improvement for sure. For starters, you can name all of the ingredients in this pumpkin treat. No dyes, no mystery flavors. 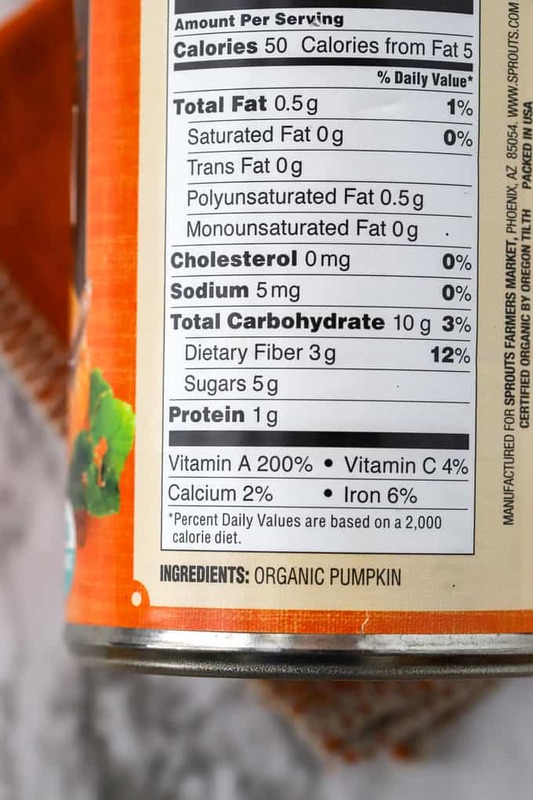 Organic pumpkin puree and organic apple sauce from Sprouts are the main ingredients. 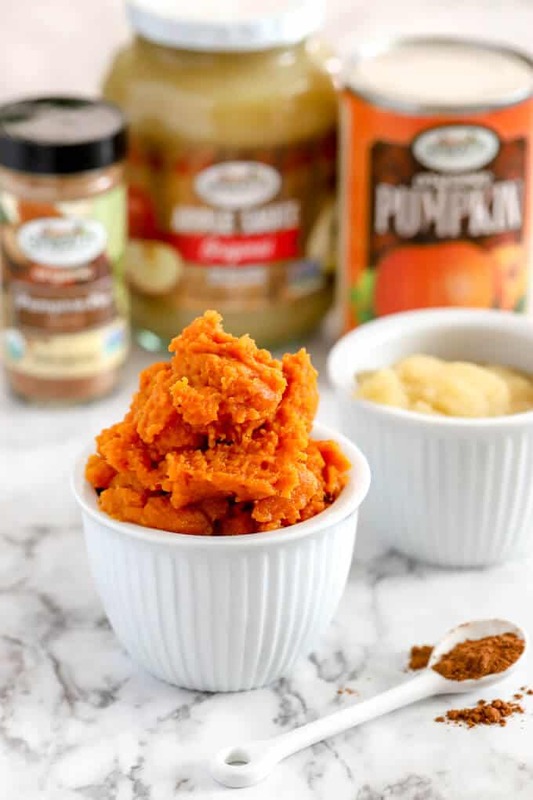 Pumpkin pie spice amplifies the flavor and the optional addition of honey really helps to create that familiar texture. I made these both with and without honey and did prefer the honey version. The pumpkin fruit leather was easier to roll and simply had a better feel in your mouth. Try it and see what you think. Why should you shop at Sprouts? Let’s dive into these ingredients a bit deeper. The pumpkin puree, the apple sauce, the pumpkin pie spice and the honey are all Sprouts brand products. 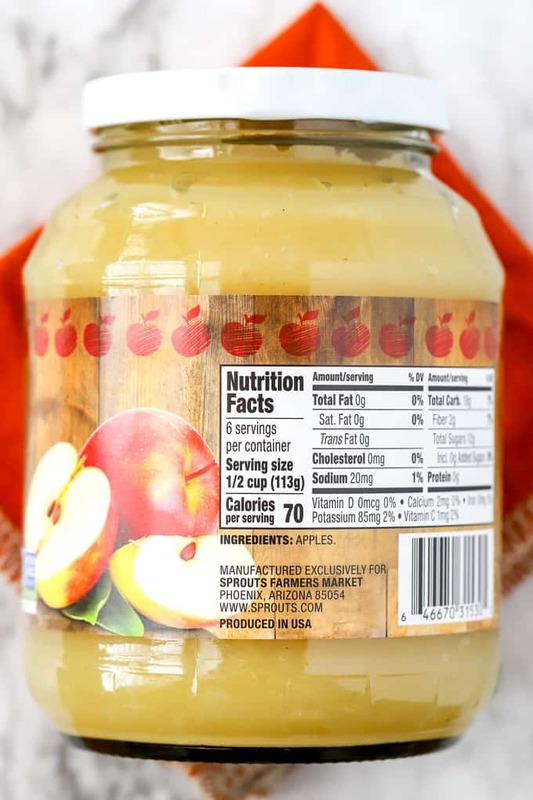 Check out the list of ingredients for the pumpkin puree and for the apple sauce: Pumpkin and Apples. Nothing more and nothing less. Knowing that I am buying high quality products from Sprouts is important for my family. More than 2,400 Sprouts brand products are offered in their stores. The focus is on quality and value. The process of making pumpkin fruit leather is so straightforward it hardly needs a recipe but let’s go over the steps together. Basically you combine the ingredients, spread them on a pan, then very slowly dry them out in the oven. After you mix the short list of ingredients, spread the puree onto a parchment lined pan or a silicone mat lined pan. Keep the thickness between 1/8 and 1/4 inch thick. You don’t want to see any gaps in the mixture. You also don’t want lumps. 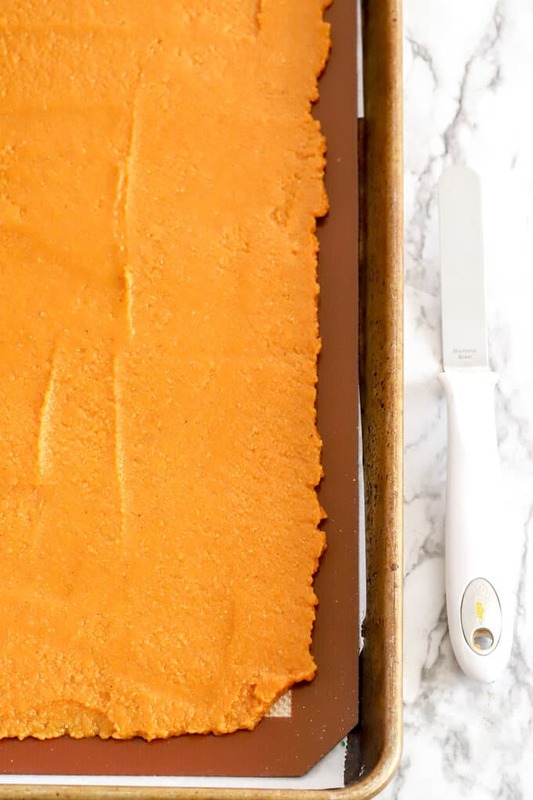 What’s the magic ingredient in making pumpkin fruit leather? Patience is the magic ingredient! Waiting for the fruit leather to slowly bake is the key to success. Don’t crank up the oven temp. Just be patient. Flip the baked fruit leather onto a fresh sheet of parchment paper. For seasonal Halloween fun, use cookie cutters to make shapes in the pumpkin fruit leather. Pumpkins, cats, bats, and witches would all be cute ideas! Use a pizza cutter to slice the pumpkin fruit leather into 3 inch strips. Roll tightly. You could tie the rolls with baking twine or just leave them as is. The rolls tend to hold their shape. 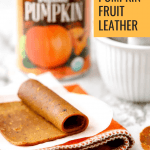 Pumpkin fruit leather is a healthy snack that you can feel good about sharing with your family. Using quality ingredients from Sprouts gives you the confidence that you are feeding your kids all natural, wholesome food even for snacks and dessert! Use an offset spatula to spread the mixture on the baking sheet to a thickness between 1/8 -1/4 inch. You do not want to be able to see through the mixture, but you also don’t want to have it too thick. Bake for 4 to 4 ½ hours until the mixture is set (not giggling) in the middle of the pan. Let cool to room temperature. Take a large piece of parchment and turn your fruit leather over onto the parchment. Peel the fruit leather off the silicone baking mat so that it is now laying on the parchment. Cut into strips using a knife or a pizza cutter. Roll tightly. For a fun, seasonal twist, use a cookie cutter to imprint shapes like pumpkins or bats onto the fruit leather before rolling it up. Still hungry for more pumpkin recipes? Want to get in touch with me? Click through to my Contact Page for more information. Thanks! Fruit leathers are so perfect alternative to store bought fruit roll ups!! It really doesn’t take much effort to make this fruit leather recipe at home– just a lot of time in the oven. I don’t have a Sprouts near where I live, but it was my favorite grocery store in Grand Junction when I was cooking near there this summer. Love the idea of using pumpkins to make a fruit leather as my favorite part of a pumpkin pie is the slightly chewy bit right by the crust. Grand Junction is a beautiful place. Keep your eye out for other Sprouts stores opening this year. I read that one is opening near Philadelphia — now when I visit my hometown just outside of the city there will be a Sprouts near by! What a great idea to make these with pumpkin. I bet kids would love them. I think your kids would enjoy this treat! What a delicious way to use pumpkin! I just know my kids would love this so might have to make it with them! I hope your kids enjoy this recipe. I had never made fruit leather at home and now see how easy it is to do. I haven’t ever made any kind of fruit leather – this sounds wonderful – and Sprouts is the best, isn’t it!? I love shopping at Sprouts, too. Glad that you have one nearby. I’m enjoying your blog so much, Holly. Going to make this yummy fruit leather soon! Hi to the “big boy”! Oh, thanks so much, Mary Jo! That means a lot to me. When is the occasion this fall for your family– a wedding or shower or other celebration? I remember you mentioning that cookies might help the festive time. I am happy to bake for you! What a great idea! 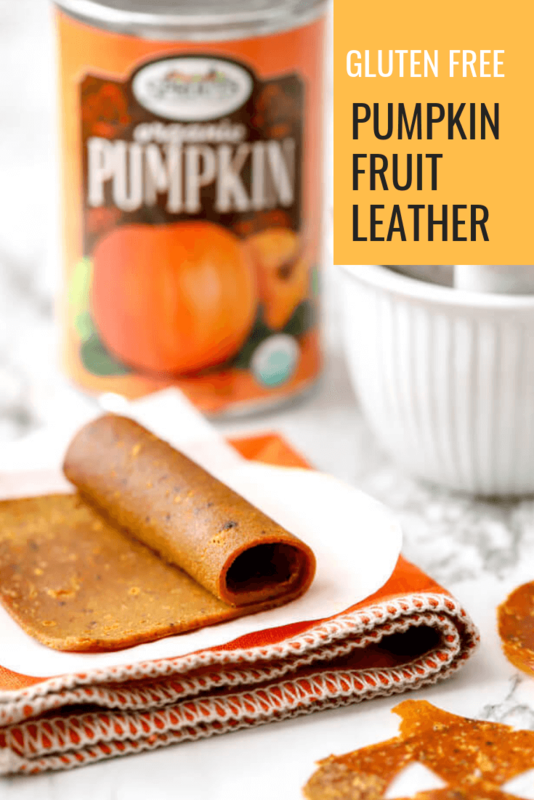 I’ve made fruit leathers with various fruits, but never pumpkin. It’s brilliant! This was my first go with making fruit leather at home. I think I’ll try strawberry next. Glad to hear you’ve had success with other fruits!